Distinguished British historian Davies (No Simple Victory: World War II in Europe, 1939–1945, etc.) 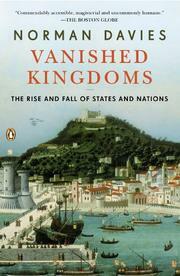 delves into 15 once-great, now-fallen states, from the ancient Visigoths to the Soviet Union. The author again displays an enormous breadth of knowledge in this selective yet comprehensive historical study of thriving kingdoms that eventually gave way to internal or external forces such as implosion or conquest. Davies is inspired by the epic movement of peoples, starting with the writhing of barbarian hordes that invaded the rotting Roman Empire, namely the Visigoths, who established the Kingdom of Tolosa (modern-day Toulouse) in 418 CE. They lasted for 89 years and spread (into Iberia) a unique Gothic speech, political culture and architecture. These were only one of many interrelated linguistic sub-groups that moved into pockets of Europe, such as the Ostrogoths, Lombards and Burgundians, all now vanished, but leaving in their wake a rich “contaminating” of language, culture and gene pool. Davies delights in recounting the “Kingdom of the Rock,” aka the Old North (Scotland), which was once inhabited by the Ancient Britons (as opposed to the Celts or the Anglo-Saxons), giving forth such legendary notables as St. Patrick, King Arthur and St. Mungo, before being eclipsed by myriad tribes and the Vikings. The author also examines the obscure state of Belarus and its capital Minsk, locus of a dizzying collision of migrating tribes, but he seems overwhelmed by the task of summarizing the complex civilization of Byzantion. Davies dwells instead on Borussia, where the early Prusai, the “People of the Lagoon,” mingled with their invited guests, the Knights of the Teutonic Order, creating a potent socio-military machine of conquest. Other recondite searches wander into Italy, Germany and her rivaling Saxon duchies, ancestral Éire and, finally, Estonia as emblematic of the Soviet Union’s pernicious cultural manipulation. A fine concluding chapter, “How States Die,” offers a robust roundup for the diligent reader. As usual with Davies, an exceedingly accomplished and dauntingly thorough study. When history is told, it is the stories of the bold and the victorious that we want to hear about. Enemies and invaders being thwarted, moments of struggle and adversity overcome, the rise of the nation state into a place of glory.